Going to my business partner’s home in Tifton is always a treat … because of the thoughtfulness of his wife, Linda! She’s a grand hostess. Linda’s delightful quilling hobby results in (after some well-placed hints) a little packet of her handmade cards wrapped in tissue and tucked up on my pillows! She knows how much I envy the BLTs the Roger gets for lunch from time to time — so I get them, too! Along with a disgusting many-layered caramel iced cake that will make you cry, it’s so good. a dash of salt and (get this!) the flavor packet from chicken Ramen Noodles! Mix a 16 oz package of angel hair slaw mix with about 4 chopped or slivered green onions. Just before serving, add a cup of slivered almonds, a cup of sunflower seeds, and (another shocker!) the crunched up uncooked package of Ramen Noodles! If no one in your crowd hates cilantro, you could have put a few chopped leaves in the mix, as well. I tried to decide how to find a good photo of the slaw to post here, but it’s difficult when it’s consumed about as quickly as it’s made. So, I posted a picture of Linda instead. 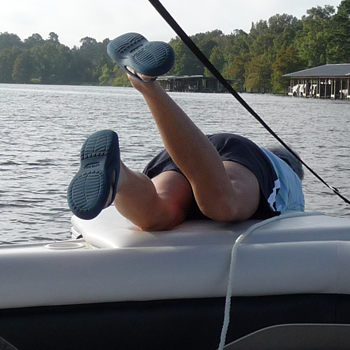 She will hate this, but I think it’s an adorable shot of her trying to pull up the boat anchor or something! The photo is about as unusual as the slaw recipe is, eh? !